My Dad used to say: "YES! is the answer. Now, what was your question?" This was always in connection with customer service. I grew up with it, and it is a part of my very being. That phrase has helped shape who am I and why I will do whatever it takes to find a solution. From the time of my very first job, I have always believed that "Customer Service" is the key, regardless of who the "customers" are. Over the years, I have learned from my mistakes (like not asking the customer if their computer had a 3.5-inch floppy drive or a 5.25-inch drive, thus getting cussed at for selling the wrong media) and I have grown in my conviction that no matter what title I hold, I will do what I need to do. I am slowly (albeit VERY slowly) coming to see that I can have assistance without appearing as though I can't accomplish something. Sometimes, I just have to stop and say, "I'm going to need your help getting this done for (insert customer)." I refuse to accept "It can't be done" as the answer. It may not be done the way was originally intended, but a solution can be found for any situation. 1. I can do it cheaply.2. I can do it well.3. I can do quickly. While I find that hilarious in my demented form of humor, I aim to hit all three whenever possible. That is part of my "Customer Service" mentality, I suppose. I hate knowing that someone I am trying to help can't succeed because of some stumbling block. In my mind, stumbling blocks and roadblocks are just things in the way that we have to figure out how to navigate around, over, or through. Many times, I will not wait for someone else to come up with a solution - I'll come up with something, even if it is temporary, to reach the intended goal. This doesn't make me "Superman" or mean that I walk on water. It means that I work my hardest to help everyone I am charged with helping, and stepping up to help those that aren't directly within the group of folks I usually support. Sometimes, I fail miserably. But, after I get up from being knocked down and try to take away a lesson learned so that next time, I can try to avoid the same mistakes. Why am I telling you all this? Because I believe "Customer Service," and I mean REAL service to the customer, is a dying art. No matter what you do for a living, no matter if is a paid position or volunteer, know who your "customers" are and what they need. Learn who they are. Learn what they need. Take time to listen - not just hear, but listen. And, above all, take action as soon as you can to solve problems that arise. Taking action can land you in some seriously hot water sometimes, too. Sometimes, you have to "tell it like is" or have a "come to Jesus" meeting about a situation. As long as you have the customer's best interest at heart, you really won't do wrong. Taking action may mean a bit of research before implementing a solution. Fine. But, get the research done and get into action solving the problem. Make calls, order equipment, hit your knees in prayer if you have to - Whatever it takes. The next time you're faced with someone who says, "I have a question..." or "Can we..." Before they ask, think to yourself (or heck, say it out loud like my Dad would), "YES is the answer. What's the question?" Thanks to my ESSDACK Newsletter, I read an article that provokes some thought into teaching and testing. The overriding question is this: If students can find the direct answer on Google, then why do they need teachers? The main point of the article is to raise students to higher level thinking. 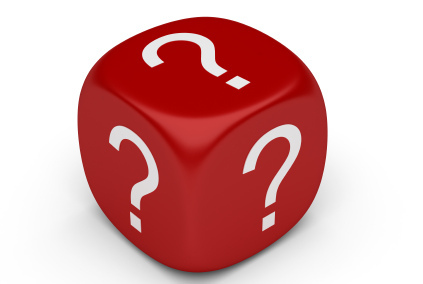 That is, ask open-ended questions that require research, development and incorporate a formulated opinion with sources to back up the responses. Of course, it took all of 5 seconds for folks to start to Google the "UnGoogleable" questions. I loved the responses. Ultimately, a rubric for scoring and parameters regarding resources lies at the heart of the grading of such questions. For example, several Wikipedia entries can answer the questions. A well-crafted rubric might require students to seek out primary sources or at least corroborating sources. Now, mind you, this article is written specifically for History teachers. You can save any rhetoric on why students need to know basic math, etc, for another discussion. Or heck, start one here, why not? Do we need to know names and places and dates in a laundry list when that laundry list is at the fingertips 24 hours a day? No. The key, though, is figuring how to incorporate that laundry list into meaningful, thought-provoking research. And, the research doesn't have to be 10 pages or even 3 pages. It can be a paragraph. About a dozen years ago, the Prescott team was scheduled to play the Little Rock High School Tigers here on Saturday afternoon. The GAZETTE's Sports Editor was out of the city, and one of the reporters was assigned to interview Coach Quigley of Little Rock Friday afternoon and to write an article about the impending game. Quigley told the reporter that the Prescott lads were very tough, and that he expected a hard game. But in putting the idea on paper, the reporter used an unfortunate expression. He said that the Tigers wre expecting a "good workout" which was totally different from the idea that Quigley had in mind. On the following Saturday, the Prescott team proceeded to administer a handsome beating to the Little Rock lads. About nine that night a Western Union messenger brought to the news editor's desk the following message from Prescott. "What do you think of the workout we gave your Tigers this afternoon? Prescott High School Football Team." 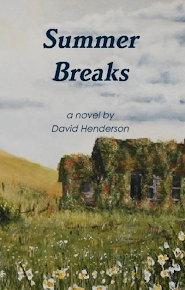 When the news editor recovered from the shock, he wrote a few paragraphs intended to be humorous in which he expressed the idea that the Little Rock athletes had received a fine workout indeed. He expressed relief that the workout had been no more strenuous because if it had been, Little Rock wouldn't have had any football team left, and there were quite a few games remaining on the schedule. On the following Monday, morning assembly exercises at Prescott High School were turned into a celebration of the victory. 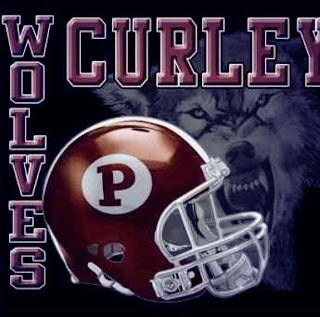 The GAZETTE article and accompanying headline were read, and by unanimous vote "Curley Wolves" was adopted as the football team's official nickname. 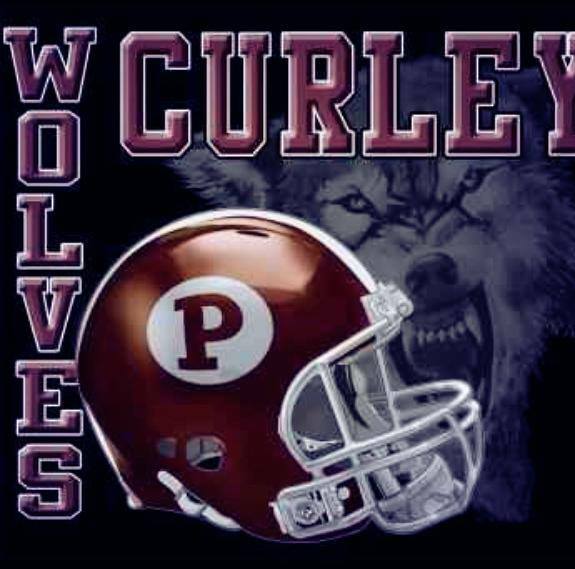 They've been Curley Wolves ever since. In the fall of 1911, Mr. Adam Guthrie, who had the previous spring graduated at the University of Arkansas, and for three years had made a brilliant record as member of the Razorbacks, organized and coached Prescott High School's first football team. The team won a game and lost one with Hope High and lost to Texarkana High. *The above was taken from a Word Document off the Prescott, Arkansas, school website in Aug 2013. It also appears in at least one forum online (FearlessFriday). If you get one of these, let me know what you think! Wait... Is THIS what the "rains down in Africa" was about!? Hail! Hail! The gang's all here! In late 2006/early 2007, I had just begun working for the Southwest Arkansas Education Co-op as their Distance Learning Coordinator. The Tech Coordinator at the time, John King, and I were invited to a meeting headed up by the major players in Arkansas distance learning at the time. The main issue at hand: Could there be a central hub where anyone in the state could get information about distance learning in K12? John and I looked at each other for a split second, and answered, "Yes. We can do that." We had nearly no idea how we would do that. We had been playing with software called "Sharepoint" and figured we could leverage that software to do what was needed. So, we bought the unlimited version of Sharepoint with a grant in 2006. We bought MOSS 2007 before it was officially released, which made for interesting set up and configuration issues. Once the official version was released, we got it up and going. We were so far ahead of the curve at the time, we spent days on the phone with Microsoft as we worked together to solve various issues they hadn't encountered before. Thus the ARDL (ARkansas Distance Learning) portal was born. We initially used one master list for all the courses being offered in the state. Providers would email me the Excel template and I would import the courses. It was crazy. But, it worked. As I learned how to use the system more, we added features like filtered searches, text searching, sorting, and more. We expanded the course listing feature and offered free classroom space on he server to any public K12 distance learning teacher in the state. We held various trainings to help get instructors on board. We created forums for providers, instructors, tech personnel, distance learning coordinators, and more. Each group had a private place they could feel free to discuss issues related to their functions. We also had general discussion areas where folks could ask questions to anyone. As time went on, it became easier for the providers to add their own courses and the portal began reaching more and more people involved with distance learning in the state and beyond. In October 2007, Southwest Arkansas Education Co-op and the key players in running the ARDL Portal were awarded the K12 Distance Learning Service Award from ARDLA (the Arkansas chapter of the US Distance Learning Association). That award was specifically created because of the impact the Portal already had in its short life. For the next 6 years, Southwest Arkansas Education Cooperative hosted the Distance Learning Portal at no charge to the state nor to any of the participating districts or providers. This included maintenance, updates, content changes, teaching new users how to use it, backups, etc. In 2011, the DL program was growing, maturing, changing. A year later, all the information contained in the ARDL Sharepoint database was sent to the next host. In August 2013, the ARDL Portal found a new permanent home. I am very proud to have been a part of something so new and as far-reaching as the ARDL Portal. I feel as though I have taken it, raised it, and now it is time to let it go. In a lot of ways, it is much like my personal life: this year, my son goes to college. Thank you to everyone in Arkansas K12 who took a chance on a couple guys who had almost no idea what they were doing. Sometimes, you just have to say, "Yes. We can do that." And then do it. Unplug/replug power from switches and wifi access point. Did not resolve issue. Testing wired workstation. It could not connect. Checked wiring. Loose connection at wall. Reseated. Wired workstation tested and working. Wifi stations still down. Unplugged power from access point, replugged. No fix. Unplugged/reseated network cable from switch end to access point. No fix. Unplugged/reseated network cable from access point end. Fixed. Not sure why we have to reseat the connection on the access point end, but that fixed it. I strongly advise all school personnel to work with their tech department before buying any computers. If you purchase a computer on your own, chances are it will *NOT* work with your school network. Many districts require authentication credentials when connecting to the network. Computers you buy at Best Buy or Walmart or anywhere off-the-shelf are *NOT* going to have the Professional version of Windows. There is an extra cost (either in terms of money or man hours or both) to get that new computer to work on the school network. Save everyone a lot of headaches, and TALK to your TECH person before making a purchase. Thank you. The school tech and I labeled fiber in preparation for the demarc/fiber center move that I discussed in a n earlier post. I plan to be there for the move to offer tech support, muscle support, and/or moral support. And prayers. Want to see prayer on a school campus, come watch a bunch of folks moving the network core (while it is still live) from one location to another. Oh yes. There will be prayer. While at that district, I took a call from the office regarding a new electrical line we were having installed. It was supposed to have been done last week, but the vendor never showed or called. We won't be using that vendor again. Anyway, that vendor did show up to run the line but "no longer possessed" the information regarding the type of outlet connector needed. Seriously!? Totally unprofessional in my opinion. Again, we will not be using them in the future. The line finally got installed, but the connector installed does not look exactly like the one pictured in the specs for the new device. We'll see when the device vendor shows up to install things. I have a short fuse for incompetence and non-communication. taken as an "OR" situation, I can handle either one. But when they become "AND," we have a problem. That cured her, so far as we can tell. We also did change some folder permissions directly (Right-click, Get Info, Permissions), but I believe the commands above did the actual work. I worked with a different user about setting up her classroom. Due to power circuit issues, I will have to revisit the room to install the equipment at a later date. This morning, the DL Coordinator and I drove in separate cars to a local district in order to get their compressed video equipment relocated to another room. I took my own car because I was doing some training after the move was done. While the DL Coordinator hooked up equipment, I worked with the local tech to reroute the fiber path to the new location. Luckily, there was an used fiber connection in the building. That left us to map out wiring from the room to the drops in the closet to the tech closet across the hall. Again, as luck would have it, the guy who ran the wiring in the new room pulled two runs back to the tech closet. Whew! No running wires for us! After a false start or two, we had the video unit connected to the correct network. FYI, in Arkansas, the video network is a separate, dedicated LAN connection. Some sites set up VLANS to handle things, but most sites just use physical separation since it is generally easy to do. We ran into a weird issue where the Polycom unit had reset the admin password AND had cleared out the Gatekeeper information. All other info had been retained, though. Can't say I've seen a "partial reset" in a video unit before. There is a first time for everything, as they say. Once we had the unit up and going, we ran a couple test calls and called it good. I stayed for a 3-hour training on a new online forms program the school is subscribing to through us. There was a lot of very good discussion and they got an overview of what the system does. After the training, I came back to the office where I have been performing other duties: answering emails, troubleshooting, etc. I'll do that until 5:00pm. When I explained the significance of the number, she said, "I am ridin' with White and Nerdy." Hanging out after a good meal. We are calling it "Rhino in Chair"
My Mom won a major award!! Hahaha! "It's like I'm the boss in one of those big chairs..."
On Wednesday, I headed up to Blevins to help their new tech get some things done. We started in the Distance Learning Lab, where the tech and her son were finishing up installs for Plato. As that was happening, we walked down to a teacher's room to help trace out network wiring and to do a little housekeeping. That ended up also including attaching the computers in the room to the domain. Since they have a new tech, I made sure to walk through things step-by-step so she could take whatever notes she needed and so she could follow the process. I am a big believer in "teaching to fish," so after I ran through it once with her taking notes, I had her run through it herself. We covered attaching computers to the domain, setting reservations in DHCP for printers, etc, and installing the newly reserved printer(s) on the computers. She also mentioned locking students out of Control Panel on her Win7 machines, and I gave her something of a crash course in Group Policies. When she logged in as a student and the Control Panel was gone and locked, that made her day! NOTE: Modifying the registry can do irreparable damage to your computer if not handled with care. I make no warranties or guarantees, expressed nor implied. You edit the registry at your own risk. I assume no responsibility for any damage to your computer, operating system, network, etc. Get permission from your specific designated authority before adding/removing/modifying any software installed on the computer upon which you are working. Completing the above steps on a computer without permission may result in various disciplinary actions at your school or business. I am not responsible for any such actions taken against you or anyone associated with your organization in conjunction with information contained in this post or any other. We took care of a few other issues, and that pretty well ate up the entire day. As we were wrapping things up, the tech wanted to show me the progress on a building project the district has going on. In my eyes, it is one of the most ambitious ideas I've been this close to. Their core and demarc points were centrally located in a pair of portable buildings that had been connected via enclosed breezeway. For many years, this also served as the central admin offices. After central offices were moved, the building was used as a tech office and band hall. The district had a metal building at another location and decided they wanted to replace aging portables with this newer metal structure. The problem: the network core and demarc are in there, remember? Well, the Superintended came up with a plan: tear down everything except the closet that housed the servers, fiber, telco, and air conditioner and then build the metal building around the core. Once that's done, they would move the equipment from the closet and finish out the building. What you see in the photo above is the tech closet with air conditioner on the left (in center of photo) and one of the portable buildings on the right. The other portable building has been removed as they prepared the closet to stand alone. This was taken roughly June 24, 2013. Below, we have an image as things were on July 31, 2013. You can see the poured concrete surrounding the closet. The closet sits on the cut beams that used to hold up the portable building. You can see the metal structure going up around the core network closet. The plan, as mentioned above, is to finish most the metal building. Once that is done, the contents of the tech closet (fiber, servers, telco, etc) will be moved to an area almost directly in front of the door you see in the photo. The thought is that connectivity will be down for 10-15 minutes during this process. I would venture an estimate of 3-5 hours, assuming everything remains in tact during the move. After everything is moved, they will finish the metal building which will house the technology equipment and two classrooms. I will do a follow-up later with how things transpire.